Water and flood damage has the potential to escalate to a serious emergency if not treated immediately. Contaminants in the water and mould growth could severely affect the progress of emergency services provided as well as escalate the cost of remediation. WINMAR® will work closely with you to ensure your belongings are protected and cared for. Our fire restoration technicians will commence the cleaning process to prevent further damage from residue. We will work with you to determine which contents can be cleaned and restored. 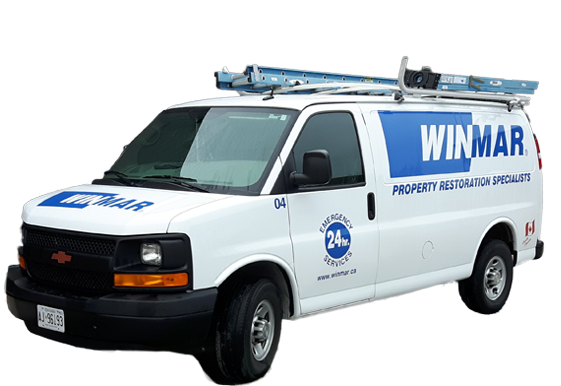 WINMAR® professionals will expertly assess the extent of damage to your property and safety of your home. Considerations to stabilize your property and installation of temporary power may be necessary as well as the likelihood for debris removal. Our WINMAR® technicians are cleantrust certified, trained to recognize and remediate your mould issues in a safe and contained manner. Our number one objective is to make sure the safety and health of the occupants as well as our technicians is protected. Whether you have a small amount of mould in your bathroom or a 700 unit apartment complex, your local WINMAR® office will be able to assist you with any clean up necessary. Our goal is to provide our customers peace of mind. WINMAR® London has helped thousands of Canadians in their greatest times of need. With over 1500 employees from coast-to-coast, our WINMAR® family network will do everything necessary to help you with your damage. From a flooded storage room to a community ravished by a natural disaster – WINMAR® Comes Through For You.